I love good old American burgers. I own James McNair's Build a Better Burger. You can use other ground meat for other recipes, such as moussaka and shepherd's pie and stuffed peppers, tomatoes and cabbage. Burgers do not have to be meat. There are lots of delicious vegan and vegetarian burgers. Cooking Light Food editor Tim Cebula shares his secrets for the perfect grilled burger. The jalapeño is in the creamy ranch sauce. Combine all the sauce ingredients until well blended. Refrigerate until needed. Preheat a grill or broiler. Divide meat into eight portions of equal size, and shape each portion into a thin patty four to six inches in diameter. Season to taste with Lawry's seasoned salt and white pepper. Spread margarine on top and bottom of four hamburger buns, and on the bottoms of four additional buns; reserve the four tops without margarine for another use. Lightly toast buns, and set aside. Grill hamburgers on one side, turn them over, and top four of them with one slice of cheese. Grill to taste, then remove from heat. To assemble: Spread 2 teaspoons of Mighty Mo sauce on bottom of each of four buns. Top sauce with some shredded lettuce and a burger without cheese. Top with the additional bun bottom, and spread with 2 more teaspoons of sauce. Top with a cheeseburger patty, and put two pickle chips on top of cheese. Add top of bun. Serve with french fries. Combine sirloin, Worcestershire, spices, thyme, hot sauce and grill seasoning. Mark meat into 4 sections and make 4 patties, 1-inch thick. Using the reserved 1/4 onion piece, grate half of it on the burgers. Drizzle extra-virgin olive oil on the patties. Cook patties 4 minutes on each side for medium or, until desired doneness. Combine chicken, chipotle powder, cilantro, hot sauce and grill seasoning. Score and divide meat into 4 sections and form big patties, 1-inch thick. Using the rest of the 1/4 reserved onion piece, grate the other half of it on the burgers. Drizzle patties with extra-virgin olive oil and cook 6 minutes on each side or until meat is firm and cooked through. Heat a medium skillet over high heat. Add extra-virgin olive oil and peppers and onions. Stir-fry the veggies tossing them with tongs to sear them at edges. Add the jalapeno or serrano pepper. Toss and turn the mixture about 3 minutes, then add salsa of choice and toss a minute longer. Place burgers on each bun bottom and top with 1/4 of the pepper and onion mixture and bun top. Serve Bacon and Bean Smash on the side. Heat a medium skillet over medium high heat. Add extra-virgin olive oil and bacon. Render fat 2 minutes then add onion and garlic, cook 5 minutes. Deglaze pan with beer or lime juice. Add 1 can of beans to the pan and season them with salt, pepper and cumin then smash them with a potato masher, combining them with bacon and onions. When they are combined, add remaining can of beans and combine with smashed beans. Add hot sauce to your taste and serve. Chopped cilantro or scallions and sour cream are optional garnishes to this smash. Subtle but delicious! Cooking it in a cast iron skillet makes all the difference! This results in a crusty outside and juicy inside. Combine all the ingredients and form into 8 oz patties. Season with salt and cook about 3-4 minutes on each side. Makes 2 8 oz burgers. To prepare burgers: Place turkey, scallions, garlic, Worcestershire sauce, lemon zest, oregano, 1/2 teaspoon pepper and 1/4 teaspoon salt in a large bowl. Gently combine, without overmixing, until evenly incorporated. Form into 8 thin patties about 4-inches wide and 3/8 inch thick. Heat 2 teaspoons oil in a large nonstick skillet over medium heat (see Grilling Variation). Add burgers and cook, turning once, until an instant-read thermometer inserted in the center registers 165�F, 8 to 10 minutes total. Warm the marinara on the stove. To assemble the burgers, spread 3 tablespoons of marinara on each toasted focaccia, top with a burger, about 3 more tablespoons of marinara and 1 tablespoon of the remaining cheese. Grilling Variation: To grill the turkey burgers, preheat a grill to medium-high. Oil the grill rack (see Tip). Grill the patties, turning once, until an instant-read thermometer inserted in the center registers 165�F, 8 to 10 minutes total. Heat a large nonstick skillet over medium-high heat. Add 1 teaspoon oil to pan; swirl to coat. Add onion and garlic; saut� 3 minutes or until onion is tender. Remove from heat. Place 1 bun in a food processor; process until coarse crumbs form. Remove breadcrumbs from food processor; set aside. Combine mushrooms, lentils, 2 teaspoons mustard, and the next 3 ingredients (through salt) in food processor; pulse to combine. Combine onion mixture, breadcrumbs, mushroom mixture, and egg in a large bowl, stirring well. Divide mixture into 4 equal portions, gently shaping each into a 1/2-inch-thick patty. Heat a large nonstick skillet over medium-high heat. Add the remaining 2 teaspoons oil to pan; swirl to coat. Add patties; cook for 4 minutes on each side or until browned. Remove patties from pan; arrange in a single layer on a baking sheet. Sprinkle patties evenly with cheese. Place under broiler for 2 minutes or until cheese is softened. Combine canola mayonnaise and remaining 2 teaspoons mustard in a small bowl. Spread the top half of each of the remaining 4 buns with 2 teaspoons mayonnaise mixture. Top each bottom half of bun with 1 patty. 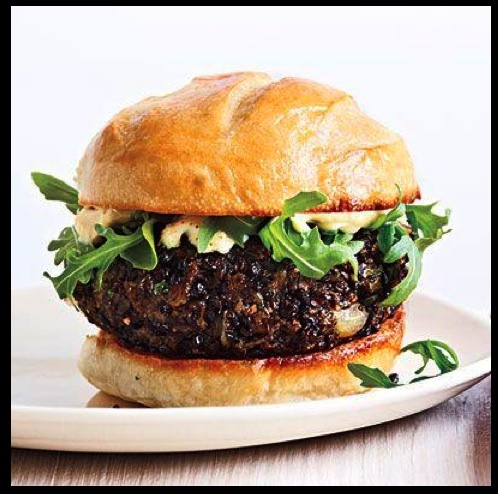 Divide arugula evenly among burgers; top with top half of bun, mayonnaise-coated side down. It is said that burgers were first served over a hundred years ago at the Saint Louis Fair in 1904. Chronicle did a story on Burgers on Tuesday, May 17, 2005. Here's what they came up with. Andy says "use 75/25 blend for juicy burgers; grill to 125 degrees; season with crushed pepper and Kosher salt.